The DeKalb County School District (DCSD) invites all students, teachers and parents to a day filled with strategy, tactics and deep thinking at Stone Mountain Middle School. 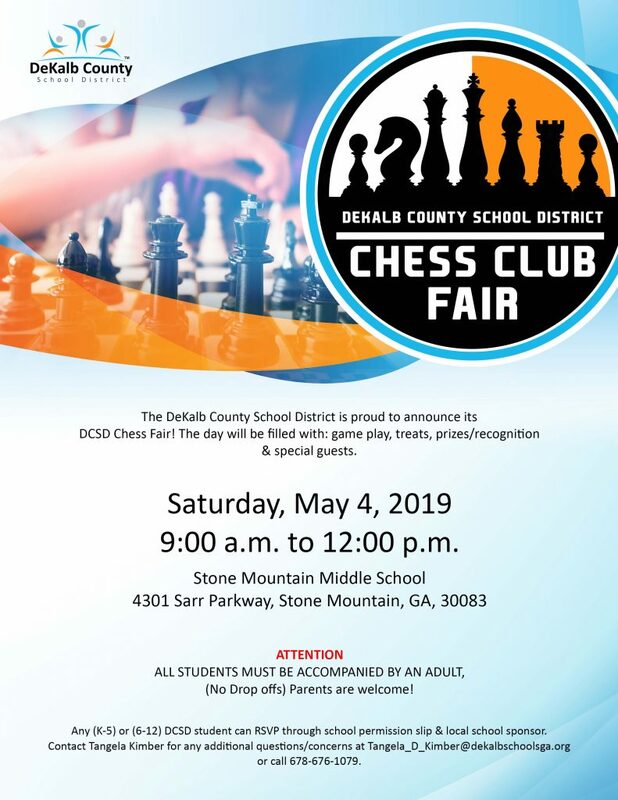 Stone Mountain Middle—located at 4301 Sarr Parkway in Tucker—will host the seventh annual DCSD Chess Club Fair on Saturday, May 4 from 9 a.m. until noon. The event will feature chess gameplay, door prizes, recognition, refreshments and special guest speakers. One special guest will be local nonprofit founder and public speaker Orrin Hudson. In 2001, Hudson founded Be Someone, an organization that uses chess to promote self-esteem, responsibility, and critical thinking among children in underserved communities. Anyone wishing to attend the 2019 DCSD Chess Club Fair can RSVP using a school permission slip or through local school sponsor. RSVP is encouraged but not required. All students must be accompanied by an adult. For more information, contact Region 3 coordinator Tangela Kimber at tangela_kimber@dekalbschoolsga.org or 678-676-1079.